Wow, I had quite the weekend! I, along with two of my best friends and pup Hewitt ventured up to beautiful Boone, NC for the weekend. We stayed at an amazing house on the side of a mountain (literally) and had so much fun. The biggest surprise (for me) was the fact that we didn't have a tv. We were tv-less all weekend. It was actually awesome because we talked and laughed and played board games and was way better than ignoring each other by watching movies all weekend. -The purchase of multiple wigs at the after-Halloween sale at the local Walmart. -The subsequent photo sessions using said wigs. -Gazing on the snow-covered hillside and mountains...which is quite unusual for early November. I also may or may not have dressed up like an old lady for a brief period of time. 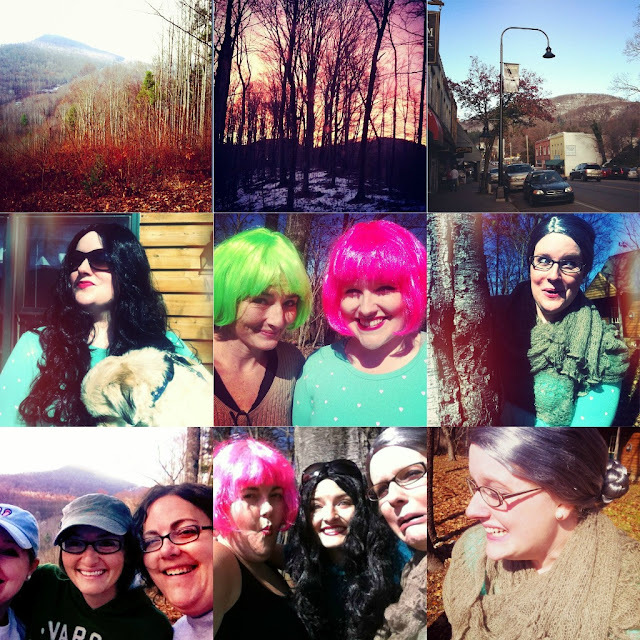 Oh, and there was lots and lots of Instagramming. I'm linking up with Sami, Leeann and Dana for this Weekend Update. What did YOU do this weekend? It looks like y'all had fun! We were in Boone a few weeks ago (during peak leaf season) and the best parts were s'mores and ghost stories around the fire-pit, and spotting some deer right off the balcony. This weekend we raked leaves, went shopping for OCC, watched Lemony Snicket's A Series of Unfortunate Events (Jim Carrey's BEST), and little girl and I took a 3 hour nap Sunday afternoon! Your weekend looks like so much fun. I can't wait to see snow covered mountains. I'll be sending your your secret santa partner soon. Your weekend sounds right up my alley. My brother went to App State for a year, and I spent one weekend that fall in Boone. It's a gorgeous time of year to be there!